Recommendations from soil test results are based on soil calibration studies that correlate soil test levels to crop yield response. In Ohio, this response curve data was used to develop Extension Bulletin E-2567: Tri-State Fertilizer Recommendations for Corn, Soybeans, Wheat, and Alfalfa, which was a coordinated effort of Michigan State University, The Ohio State University, and Purdue University. This fact sheet describes how to use a soil test result and tables in Tri-State Fertilizer Recommendations for Corn, Soybeans, Wheat, and Alfalfa to develop phosphorus and potassium nutrient recommendations. The nutrient recommendations are then developed into a fertilizer recommendation. This fact sheet does not provide the steps to determine a lime recommendation, but soil pH should be considered first in developing a nutrient plan since availability of many nutrients is pH-dependent. Soil pH and lime recommendation development are thoroughly covered in the Ohio State University Extension fact sheet Soil Acidity and Liming for Agronomic Production. According to Tri-State Fertilizer Recommendations for Corn, Soybeans, Wheat, and Alfalfa, “Tri-state recommendations are designed to provide adequate nutrition for the crop, and to create or maintain a soil capable of providing sufficient nutrients without fertilizer addition for one or more years.” The tri-state fertilizer recommendation philosophy for phosphorus and potassium follows a buildup and maintenance approach as opposed to a sufficiency approach. If a nutrient is below the critical soil test level, fertilizer is annually applied until the soil is capable of supplying the nutrient required by the crop (buildup stage). Once soil test values reach the critical soil test level, a maintenance approach is used, where nutrients removed with annual crop production are replaced through fertilizer applications. When soil test levels are above the maintenance limit, low or no fertilizer is recommended to drawdown the soil test level. It is important to note that fertilizer recommendations developed by soil test laboratories or agricultural retailers may or may not be based on Tri-State Fertilizer Recommendations for Corn, Soybeans, Wheat, and Alfalfa since there is no requirement to use this criterion. Check with the recommendation provider for the standard used in developing fertilizer recommendations they provide. In this example, a one-year fertilizer recommendation for grain corn will be developed using soil test results shown in Table 1 and the desirable nutrient ranges shown in Table 2; Tables 13 and 18 from Tri-State Fertilizer Recommendations for Corn, Soybeans, Wheat, and Alfalfa will also be used. Appendix A contains a blank template for future fertilizer calculations. Determine the crop yield potential by averaging the yield of the last five years, not including the highest and lowest yield. In this example, the corn grain yield potential is 140 bushels/acre. Use soil test results from representative soil sampling (Table 1) to compare with the desirable range for phosphorus and potassium shown in Table 2. Write the soil test results in the table column named “Soil Test Value” as shown in the Table 2 example. Compare soil test values to the desirable range. Phosphorous is reported as 23 ppm and is in the middle of the range with the critical level of 15 ppm and maintenance limit of 30 ppm. In addition to the potassium soil test result, cation exchange capacity (CEC) is also used to develop the potassium recommendation. For this example, the CEC is 10 and the soil test is 72 ppm. For a soil with a CEC of 10 ppm, the critical level is 100 ppm and the maintenance limit is 130 ppm. Table 1. Example soil test results. Table 2. Example nutrient and fertilizer recommendation worksheet with desirable pH and nutrient ranges. To develop the phosphorus recommendation, use Table 13 from Tri-State Fertilizer Recommendations for Corn, Soybeans, Wheat, and Alfalfa. Locate the yield potential on the top of the chart and the soil test result on the left-hand side of the chart. 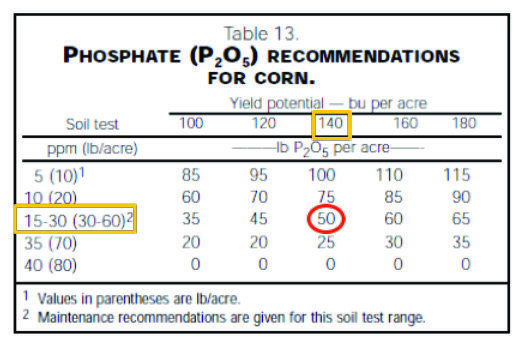 In this example, yield potential is 140 bushels/acre and soil test phosphorus is 23 ppm, which falls in the 15–30 ppm range. The resulting phosphorus recommendation is 50 pounds P2O5/acre. YP is the yield potential in bushels per acre for corn grain and CR is the crop removal in pounds of P2O5 per bushel. Corn grain removal for phosphorus is 0.37 pound P2O5 per bushel. The equations for buildup, maintenance, and drawdown recommendations are provided in Tri-State Fertilizer Recommendations for Corn, Soybeans, Wheat, and Alfalfa. To develop the potassium recommendation, use Table 18 of Tri-State Fertilizer Recommendations for Corn, Soybeans, Wheat, and Alfalfa. Locate the yield potential on the top of the chart and the soil test on the left-hand side of the chart. In this example, yield potential was 140 bushels/acre and soil test potassium was 72 ppm, which is below the maintenance range. The CEC of this soil is 10 meq/100g (shown in Table 1). The potassium recommendation is 95 pounds of K2O per acre, which is based on crop removal plus additional potassium to build potassium soil test levels. 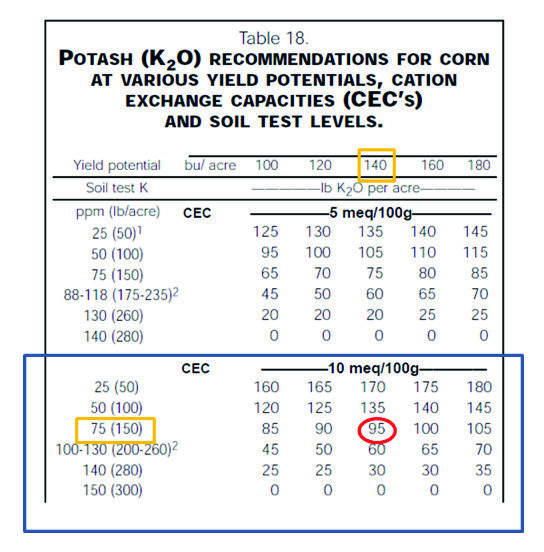 CL is the critical level (100 ppm at a CEC of 10), STL is the soil test level in ppm, CEC is the cation exchange capacity in meq/100g, YP is the yield potential in bushels per acre for corn grain, and CR is the crop removal in pounds of K2O per bushel. Crop removal is 0.27 pound of K2O per bushel of grain corn. The equations for buildup, maintenance, and drawdown recommendations are provided in Tri-State Fertilizer Recommendations for Corn, Soybeans, Wheat, and Alfalfa. A spreadsheet to calculate phosphorous, potassium, and lime recommendations for multiple field and up to a three year crop rotation can be downloaded at agcrops.osu.edu/specialists/fertility/fertility-fact-sheets-and-bulletins. To calculate fertilizer application rates, first consult the guaranteed analysis of the commercial fertilizer being used. Commercial fertilizer sources are required by law to give the guaranteed analysis of the fertilizer. The three values given on fertilizer bags are nitrogen, phosphorus, and potassium (N-P-K). Additional nutrients such as sulfur or micronutrients may also be given after these three initial values. Nitrogen is given in pounds of N per 100 pounds of product, phosphorus is given in pounds of P2O5 per 100 pounds of product, and potassium is given in pounds of K2O per 100 pounds of product. For this example, 11-52-0 is the fertilizer source to meet the phosphorus requirement and 0-0-60 is the fertilizer source to meet the potassium requirement. From the guaranteed analysis, the actual amount of fertilizer product to apply needs to be calculated. Additional nutrients that will be applied need to be calculated (i.e., the fertilizer 11-52-0 used to meet phosphorus requirements also contains nitrogen). Pounds of fertilizer to apply per acre and additional nutrient application calculations are shown in Table 3. Table 3. Pounds of fertilizer to apply per acre to meet phosphorus and potassium requirements and additional nutrient application calculation. 1Amount of fertilizer to apply = (nutrient recommendation) ÷ (fertilizer analysis/100). For phosphorus in this example, 50 ÷ 0.52 = 96, which means 96 lb of 11-52-0 needs to be applied to meet the phosphorus requirement of 50 lb P2O5/acre. 2Other nutrients added = (pounds of fertilizer/acre) x (fertilizer analysis/100). When 11-52-0 is applied, nitrogen is also applied. When 96 lb/acre of 11-52-0 is applied, 11 lb N/acre is applied accordingly (i.e., 96 x 0.11 = 11). LaBarge, Greg and Laura Lindsey. 2012. Interpreting a Soil Test Report, AGF-514. Ohio State University Extension. Available at ohioline.osu.edu. Mullen, Robert, Edwin Lentz, and Maurice Watson. 2007. Soil Acidity and Liming for Agronomic Production, AGF-505-07. Ohio State University Extension. Vitosh, M.L., J.W. Johnson, and D.B. Mengel. 1995. Tri-State Fertilizer Recommendations for Corn, Soybeans, Wheat, and Alfalfa. Extension bulletin E-2567. Available at extension.purdue.edu/extmedia/AY/AY-9-32.pdf. 1Pounds of fertilizer per acre = (nutrient recommendation) ÷ (fertilizer analysis/100). 2Other nutrients added = (pounds of fertilizer/acre) x (fertilizer analysis/100).